How Do I Get Defined Abs? If it is so simple, why doesn't everybody have defined rock hard abs? That's easy...because they take so much self-discipline to get them. * Putting on slabs of fat is easy. Getting it off takes TIME and concentrated EFFORT. Most guys do not want to hear this. They want immediate results. * Making good food choices means giving up high-calorie, high-carb, high-fat foods that taste great. It takes self-discipline to start eating like an athlete instead of a regular guy. * In order to get fat off your abdominal muscles, you must establish a weekly calorie deficit by dieting and progressively increasing the intensity of your workouts. * Simply doing more crunches will NOT burn more calories. That's not reality. You must engage in whole-body, strength-building workouts (much like hardgainer routines) to build lean muscle mass. * Including cardio focused on interval training workouts is imperative. This is how athletes train to burn fat and increase lean muscle. * You will have to come to grips with the fact that getting ripped is going to be at least a 6-8 month project, depending on how much fat is covering your abs. * Stay away from crash diets that foul-up your metabolism. Stay away from protein shakes that PUT ON FAT. So, the answer to the question, "How do I get defined abs?" is...doing the things that failures do not want to do. Make good food choices...limit your portions...progressively get stronger with weight training...and integrate interval workouts in your DAILY cardio. 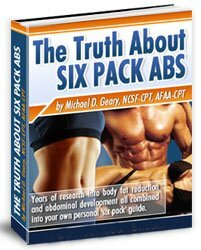 Mike Geary's program answers, "How Do I Get Defined Abs?"